This cake is the perfect celebration cake and is easier to make than you might think. If you really want to impress your friends and family, you could make homemade ice cream, but store bought will work beautifully too. Just make sure your ice cream is soft before spreading it on the cake. And one quick note on the cake and spring form pan. This recipe works in 8-inch and 9-inch cake pans, but it’s important that your springform pan is the same size as the cake pans you choose. Clean the strawberries and remove stems. Place the strawberries in a food processor and blend until smooth. You should have about 3 cups of strawberry puree. Strain the puree through a fine mesh sieve into a medium-sized saucepan. Cook the puree over medium heat, stirring often to prevent sticking and burning, until the puree has reduced by half, about 20 minutes. Pour the reduced puree into a shallow dish and allow to cool completely. Puree can be made a couple of days in advance and stored in the fridge. Butter the bottom and sides of two 9-inch round cake pans and line the bottom with parchment. Sprinkle with a little flour; set aside. In a small bowl, whisk together the cake flour, baking powder and salt. In another bowl, whisk together the milk and vanilla extract. In the bowl of a stand mixer fitted with paddle attachment, cream the butter and sugar until fluffy and smooth, about 3 minutes. Add the ¾ cup reduced strawberry puree and the egg whites and beat until smooth, another minute or two. Add in half of the flour mixture, then the milk mixture and finally, the remaining flour mixture and beat until just incorporated. 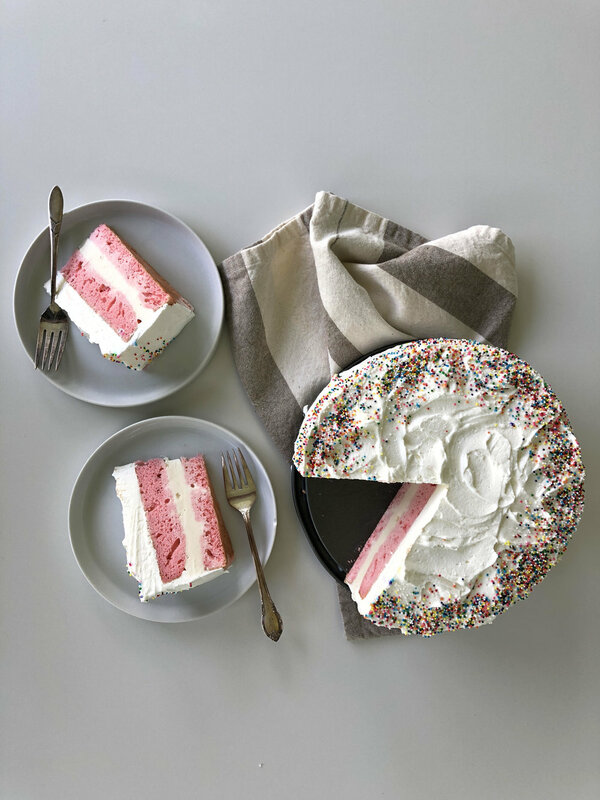 At this point, you can add a drop of pink food coloring if you want a more pinkalicious cake. Divide the batter between the two prepared cake pans and bake for 20-25 minutes, or until a toothpick inserted in the center comes out clean. Allow the cakes to cool completely on a wire rack. In the bowl of a stand mixer fitted with whisk attachment or with a handheld mixer, beat the heavy cream until soft peaks form. Add in the sugar and continue whisking until stiff peaks. Cover with plastic wrap and place in fridge until ready to use. Grease the sides of a springform pan with butter or coconut oil and then line the sides with one long strip of parchment paper. Place one of the strawberry cakes on the bottom of the springform pan. 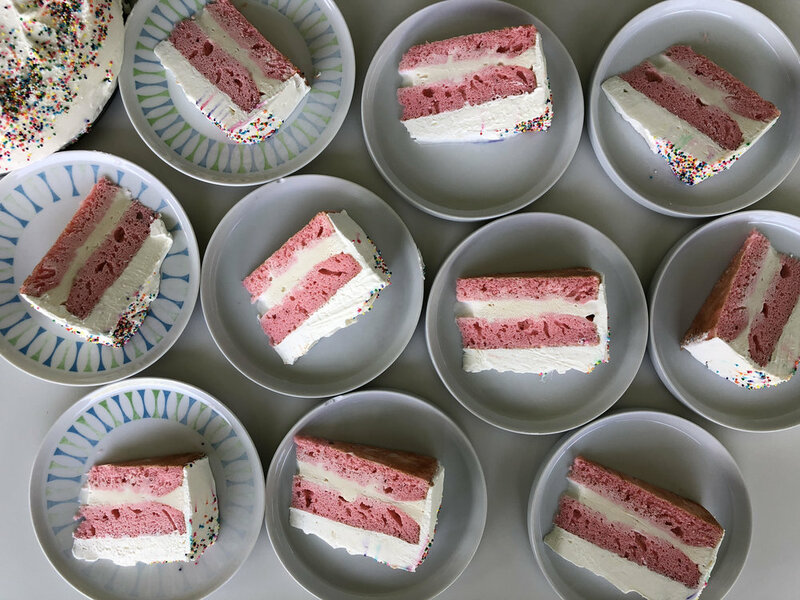 Spread the softened ice cream evenly on top and then place the second strawberry cake on top of the ice cream. Gently press down with your hand and place cake in the freezer for at least 2 hours or overnight. Unhinge the springform pan and remove the ring. Peel the parchment paper off of the cake. Frost the sides and the top of the cake with whipped cream frosting and decorate with sprinkles if desired. Before serving, allow the cake to sit at room temp for about 20 minutes. This makes it easier to slice. Plus, it’s tastier if the ice cream is softer and soaks into the cake.